Have you always wanted a pair of skeleton gloves? Maybe you need them for a Halloween or drama costume? Or maybe you just really like skeletons and want to wear them on the outside of your body instead of the inside? 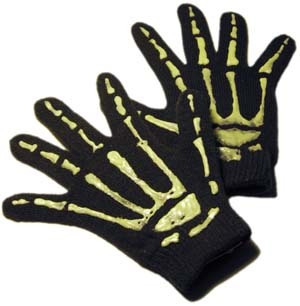 We’ve (literally) got you covered with our low-rent, budget skeleton gloves. They probably won’t be as nice as ones you can buy, but they are pretty cheap and simple to make. One pair knit gloves. Sometimes these can be found for as little as a dollar in an odds-and-ends display at a fabric store or department store. Black is great, but dark colors like navy blue, brown or deep green also work well. In the dark, it’s hard to tell the difference in colors! 1 ounce glow in the dark paint. We used Scribbles Dimensional Glow-in-the-Dark, natural. Lightweight cardboard. A leftover cereal box will be fine for this. Reference photo of skeleton hands. This can readily be found by doing a Google image search of “skeleton hand”. Make two cardboard hand cutouts by tracing around your hand on a piece of lightweight cardboard, then cutting out the outlines. These don’t have to be perfect: they only have to stabilize the gloves and stretch them a bit while you paint on them. Insert a cardboard cutout in each glove. This is probably the hardest part of the whole project! 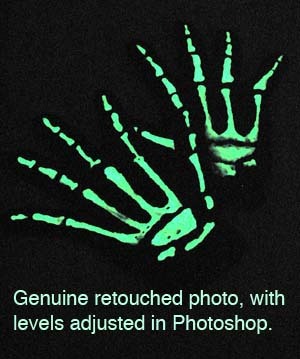 Using a reference photo and the glow-in-the-dark paint, draw bones on one side of each glove. Again, this doesn’t have to be perfect unless you just want it to be. The important thing is that people will get a quick impression of bones. Allow the paint to dry for 24 hours, then enjoy! Instead of drawing bones, glue on large rhinestones for a “diamond” bracelet and rings. Or do both – make rhinestone-wearing skeletons hands!